Coral-Reef Research Dr. Emily Rivest, now an assistant professor at the Virginia Institute of Marine Science, swims above a fringing reef in Moorea, French Polynesia, looking for corals to collect. © Brian Rivest. Back Reef Back reef, Moorea, French Polynesia. Corals growing here typically experience greater variability in temperature and pH than corals growing on the ocean side of the reef. © Emily Rivest. Fringing Reef A typical fringing reef in Moorea, French Polynesia. 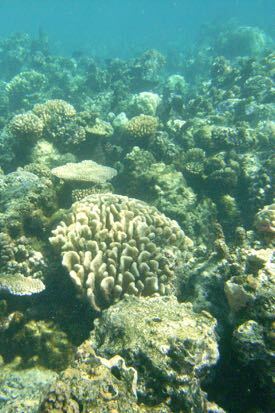 Corals growing here typically experience more moderate swings in temperature and pH than corals growing in back-reef lagoons. © Brian Rivest. Scientists typically make every effort to keep all factors but one constant when doing an experiment. Global-change scientists might move a coral from a reef to an aquarium whose water is held 1°C higher to test the effects of the ocean warming predicted for the end of the century. Or they might decrease the water’s pH by 0.4 units to study the effects of ocean acidification. But a new review article presents evidence that argues for a more nuanced approach to the design of these experiments—one that acknowledges and purposefully incorporates the variability inherent in nature. The article, in the latest issue of Current Climate Change Reports, focuses on studies examining how ocean warming and acidification might affect corals and coralline algae. Lead author Emily Rivest of William & Mary’s Virginia Institute of Marine Science says its findings are also likely applicable to other foundational reef species such as oysters. Indeed, there’s a growing consensus that the degree of variability in temperature and pH an organism faces in its current environment will likely influence its response to future warming and acidification. 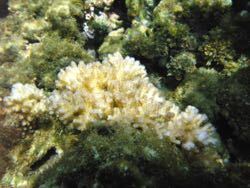 For instance, a coral growing in a back-reef lagoon—whose restricted waters may warm drastically each afternoon under the blazing sun—may be less susceptible to long-term warming than a coral growing in the more open, temperate waters of the reef face. The same may hold true for entire species or populations of warmth-adapted corals. In their paper, Rivest and co-authors Steeve Comeau and Christopher Cornwall of the University of Western Australia reviewed almost 100 studies of how predicted changes in ocean pH or temperature might affect coral growth. But their review found only a “handful” of the studies had purposefully varied these factors, or examined the importance of natural variability to the performance of reef organisms. Rivest and her colleagues found that incorporating variability into an experiment’s design produced ambiguous and intriguing results. The team says their findings could also lead to practical applications. “If we know better how environmental variability affects the ability of animals to tolerate future environmental change, then we can think about it in a restoration and conservation context,” says Rivest. 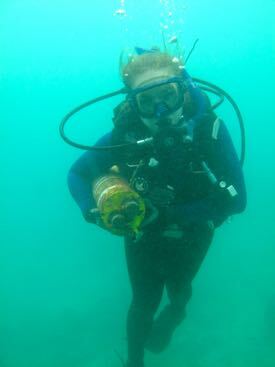 “For example, if you target a reef for restoration, we could start a training program for corals where you culture them in the lab under variable conditions so they would be ready to perform well out in the reef environment .” This approach is already being applied at the Hawai’i Institute of Marine Biology, the Australian Institute of Marine Science, and other research labs worldwide. Rivest led one of the field studies included in the recent review article—in which she compared corals from the warm waters of French Polynesia to the cooler waters of Taiwan—and now has plans to extend that research to different animals and waters near her new home on the U.S. East Coast. 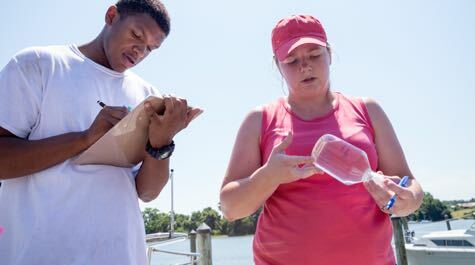 She joined the faculty of the Virginia Institute of Marine Science in Gloucester Point in 2016. She also plans to begin a series of laboratory studies. “I haven't had the ability to easily manipulate the variability of temperature and pH in the lab yet,” says Rivest, “but the aquarium system I’m building here will allow me to do that.” She’s constructing the system in the Seawater Research Lab at VIMS, one of the largest facilities of its kind in the nation. Rivest and colleagues at VIMS have also begun to put her findings to practical use, employing a recent Sea Grant award to better understand how oyster breeders and growers can improve aquaculture productivity by enhancing the conditions oyster larvae experience in the hatchery. Partners in this work include Auburn University, the University of Maryland Center for Environmental Science, Cherrystone Aquafarms, Oyster Seed Holdings, Ward Oyster Company, JC Walker Brothers, and KCB Oyster Holdings.